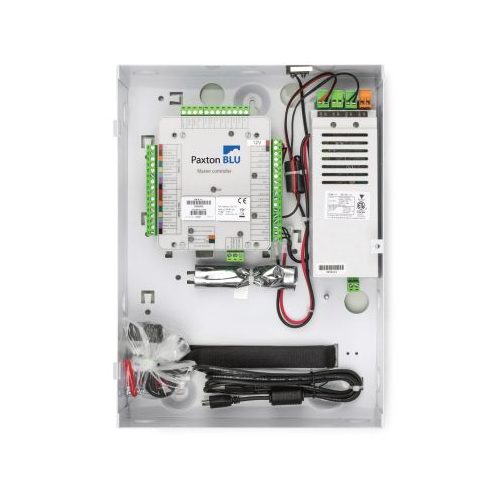 Paxton Blu is a cloud based access control system that can be managed from any Internet connected PC or a smart device. The system is managed by the dealer using an Internet connection so modifications and updates can happen any time without rolling a truck. No local server is required. One Paxton Blu master is installed per location supporting two doors. Additional 2 door slave controllers can be added to expand the system up to a total of 50 doors per master. Paxton Blu is perfect for single sites as well as multi-site jobs as the cloud service serves to simpify management from anywhere. 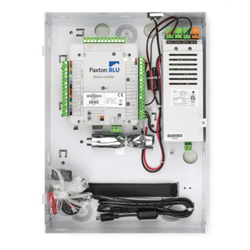 The Paxton Blu master is network connected and requires Paxton Blu cloud service. Optional cellular add-on module and cellular service plan can be added for locations without Internet.